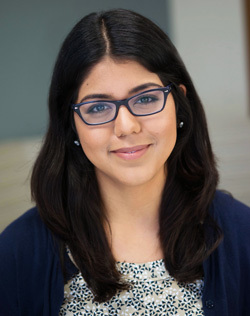 The Knowles Science Teaching Foundation (KSTF) has awarded a 2014 teaching fellowship to UC Santa Cruz alumna Brenda Minjares. Minjares earned her B.S. in physics education from UCSC in 2012. She participated in UCSC's Cal Teach Program, which provides internships, coursework, and scholarships for prospective math and science teachers. Minjares said she is committed to teaching science to high school students in the United States. In addition to a B.S. in physics education from UCSC, she earned her M.A. in teaching at UC Irvine. This fall, Minjares will begin her first year of teaching at Escondido High School, located in Escondido, Calif.
"I am very excited about this opportunity because it entails leading the team as we try to build our physics program over the coming years," Minjares said. "Without the support of Cal Teach I wouldn't have made it to where I am today." One of her mentors at UCSC, Cal Teach director Gretchen Andreasen, said, "Outcomes like Brenda's are what make working with Cal Teach so much fun. I am so happy we could help Brenda achieve her goals and address the shortage of physics teachers." Minjares is one of 32 exceptionally talented, early career science, technology, engineering, and mathematics (STEM) teachers to be awarded a 2014 KSTF Teaching Fellowship. KSTF seeks to improve STEM education by building a stable, sustainable cadre of networked leading teachers, who are trained and supported as leaders from the beginning of their careers. The KSTF Teaching Fellows Program—the Foundation's signature program—offers stipends, funds for professional development, grants for teaching materials, and opportunities for leadership development and mentoring for early career STEM teachers through a comprehensive five-year Fellowship. With an emphasis on inquiry and collaboration, the Teaching Fellows Program empowers participants to advance their teaching practice and student learning, while leading from the classroom. The Knowles Science Teaching Foundation (KSTF) was established by Janet H. and C. Harry Knowles in 1999 to increase the number of high quality high school science and mathematics teachers and ultimately, improve math and science education in the United States. The KSTF Teaching Fellows Program, the Foundation’s signature program, awards exceptional young men and women with five-year early-career Fellowships, empowering them to become primary agents of educational improvement. For more information, visit www.kstf.org.